Ok, one last Black and White CAS card for the CAS-ual Fridays tic tac toe anniversary challenge! Woohoo! My card was a CASology Honorable Mention! Absolutely perfect. You can't go wrong with black & white! I love the dots too! Thanks for playing along with us at CASology this week! What a pretty CAS card. I saw it on MIM. Clean, simple and veeeery beautiful! Thank you for playing along with us at OurCreativeCorner! Absolutely, positively CAS! :) Love this black and white beauty!!! Love the graphic feel of this card! Thanks so much for playing along with us at CASology this week! A beautiful card! Thanks so much for joining us over at CAS-ual Fridays this week! 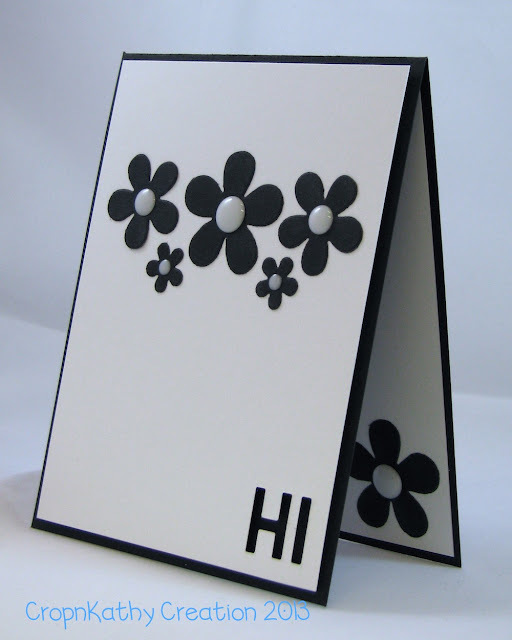 Fabulous use of die cuts for your card, clean and crisp. Thank you so much for sharing with us this week at CASology! Great card! I love the design! Thanks so much for playing along with us over at the CAS-ual Fridays Challenge Blog! Very pretty, sweet, clean and subtle but very effective! I love the striking contrast of black and white...your flowers are just beautiful, too! Very pretty card! Love the design of this great card. Thank you for joining us at Challenges 4 Everybody. Congrats to you on receiving Honorable Mention at CASology! Fantastic card, Katherine! So well-deserving of an Honorable Mention shoutout from CASology!! Thanks Darnell! I just had time to check on things today! So excited! What a great CAS design. Love the black and white combination and crisp, clean layout.